SRINAGAR: In the shelling exchange between the rival armies in Poonch sector, nine civilians are reported to have been injured in PaK. The report appeared in Pakistan media after five civilians were reported killed in Pakistani shelling in Poonch. A UNMOGIP observer briefing a police official in PaK minutes after they were attacked from Indian side. Two villagers were injured in the attack. Reports said nine people, including two minor girls, were injured in Nakyal sector on Sunday. Pakistani newspaper Dawn reported that a shell exploded on the roof of the house of one Haji Aslam in Palani village, critically injuring three of his daughters. It identified the injured as Musarrat, 22, Nargis, 25, and Samra, 15. Besides, Aleeba Majeed, 11, and Muhammad Zahoor Mughal, 35, were injured in Jair Merg and Dharoti Naari villages respectively. Quoting official sources the newspaper said three persons Abdul Aziz, 18, Abdul Ghani, 52, and his spouse Farzand Begum, 42, were injured in Balakote belt. In Naar Dabsi village, Shamim Akhtar, 50, was also injured. Of the nine injured, the reports said, six were shifted to District Headquarters (DHQ) Hospital Kotli where they are being treated. Reports of losses in the cross-LoC shelling came after Pakistani shells landed in a Poonch home and almost annihilated the family. The shell exploded killing Mohammad Ramzan, his wife Malika Bi, and their three sons: Rehman, Rizwan, and Ramzan. The couple both the daughters surveyed injured. They were identified as Nasreen and Mehreen. The family lived in Devta Sargloon village that falls under the Mendhar police station. “The five were killed inside their home when a shell fired from Pakistan side of the border hit it,” SP Vaid, J&K state police chief was quoted saying. Reports said some personnel of the United Nations Military Observers Group (UNMOGIP) who had come to see the crisis barely escaped the shelling, the report added. Earlier on Wednesday, Daw reported that two local residents were injured when they were briefing the UNMOGIP observers in Abbaspore sector of Poonch. 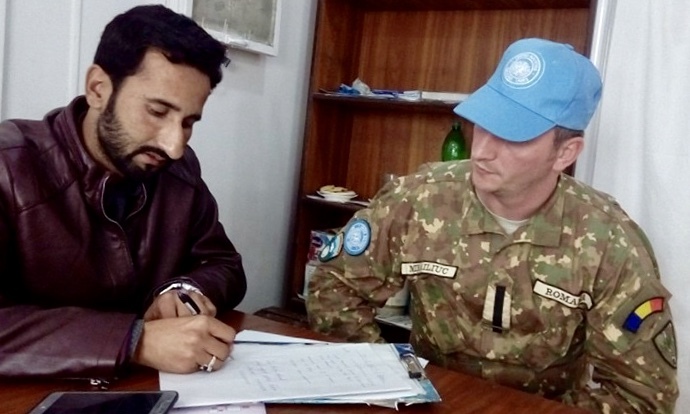 “The UN observers were interacting with local people in Polas village when suddenly Indian troops resorted to burst-firing from across the dividing line located hardly one kilometre away from there,” the newspaper quoted Arsalan, a police official, saying. Both the civilians – Sardar Saghir and Muhammad Azam Qureshi were injured. Interestingly, the UNMOGIP officials coming under fire fled from the spot in their vehicles and left the injured there. This led to mass criticism of the UNMOGIP staff pushing the officials to help them regain their image.